His Excellency the President of Umm Al-Qura University, Prof. Abdullah bin Omar Bafail, honored the University Taekwondo Team that attained the third position in the Saudi Universities Union Championship. Vice President for Educational Affairs, Dr. `Abdulaziz bin Rashad Surujy, and the Dean of Student Affairs, Dr. `Amr bin Taha Al-Saqqaf, attended the meeting at the University President's Office at Al-`Abidiyyah. His Excellency the President of Umm Al-Qura University, Prof. Abdullah bin Omar Bafail, congratulated the team for achieving this good position and wished them good luck and success. He also highly appreciated the support that the educational process at the University received from the wise Leadership (may Allah support them) that contributes greatly in qualifying well-educated personnel, endorsing their talents and enabling them to fulfill their ambitions. On his part, the Dean of Student Affairs, Dr. `Amr Al-Saqqaf, pointed out that the participation of the University Team in the Taekwondo Championship comes within the frame of the first sports assembly Championships for Saudi Universities hosted by Taif University from 2 to 4/2/1440 AH. 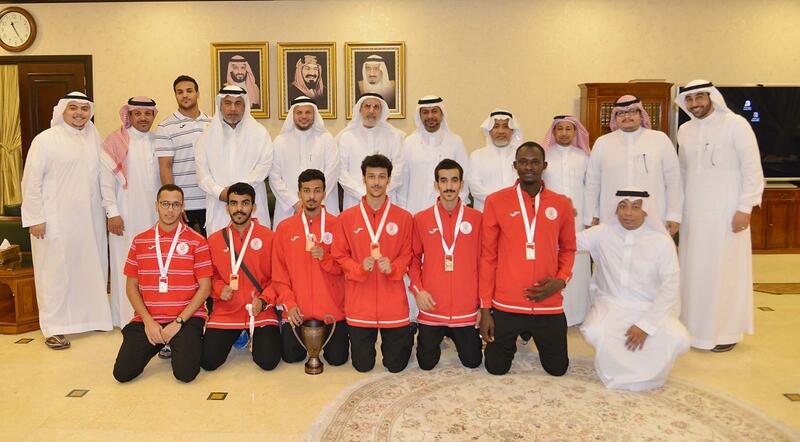 Ninety-two students representing 11 Saudi universities participated in this championship. He appreciated the care and support his Excellency Prof. Abdullah bin Omar Bafail, the President of Umm Al-Qura University gives to the activities and programs offered by the Deanship of Student affairs. He also appreciated the follow-up, by the Vice President Dr. `Abdulaziz Surugy, of the different activities offered by the Deanship.